Pablo Picasso (Spanish, 1881–1973). Bull. Cannes, c. 1958. Plywood, tree branch, nails, and screws, 46 1/8 x 56 3/4 x 4 1/8″ (117.2 x 144.1 x 10.5 cm). The Museum of Modern Art, New York. Gift of Jacqueline Picasso in honor of the Museum’s continuous commitment to Pablo Picasso’s art. Having just opened this month, Picasso Sculpture is the first exhibition of its kind in the United States in close to half a century. From now through February 7, 2016, the Museum of Modern Art in New York City will feature more than 100 beloved sculptures of the artist complemented with selected works on paper and photographs. 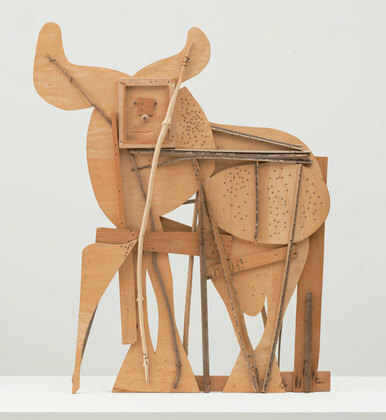 The exhibit "aims to advance the understanding of what sculpture was for Picasso, and of how he revolutionized its history through a lifelong commitment to constant reinvention."